UDM Downloads > Xilisoft Audio Maker Suite! Xilisoft Audio Maker Suite is a powerful discount pack, which consists of two products: Xilisoft DVD Audio Ripper and Xilisoft Audio Maker. The Suite is versatile audio tool including the functions of DVD Audio Ripper, Audio CD Burner, Audio Converter, and CD Ripper. Xilisoft DVD Audio Ripper can rip DVD to popular audio formats including MP3, WAV, WMA, AAC, AC3, OGG, RA, etc with the best quality. Meanwhile, Xilisoft Audio Maker can help you rip CD to MP3, WAV etc, burn popular video and audio formats to Audio CD, and also convert between all popular audio formats such as MP3, M4A, WAV, WMA, MP2, OGG, AAC, AC3, APE, FLAC, AU etc. Main Features: **DVD Audio Ripper: 1. Support ripping by chapters, custom time or custom file size; 2. Output audio quality is adjustable from 80 Kbit/s to 320 Kbit/s when rip DVD; 3. You can edit ID3 tag for your DVD sound with Xilisoft DVD Audio Ripper; 4. Allow you to select a language or audio track when ripping multi-language DVDs; 5. Support ID3v1 and ID3v2. **Audio Maker: 1. Support encrypted audio CD ripping; 2. When converting, users are allowed to pause, resume converting or stop the conversion; 3. Provide standard mode and advanced mode for beginners and veterans; 4. Support system idle and low priority conversion. Users can custom their conversion to get the best performance. 5. 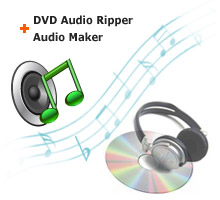 Allow users to erase information on a re-written CD; So powerful and useful Audio Maker tools, but just $59 for you. What a worthy product! We highly recommend you to own such a perfect product with 20% OFF discount price. And with our prompt and effectual One Business Day Email Service, both registered and free trial customers are welcome to send emails to us. Just free download to have a wonderful experience right now!